Dominica's economy has declined by 3.9 percent in 2015 as a result of Tropical Storm Erika, the International Monetary Fund (IMF) reported on April 16, 2016 following a mission to Dominica. "Output growth is expected to remain subdued in 2016 at 1.3 percent as the economy slowly recovers," the IMF said. "This growth, however, is largely conditional on donor grants proceeding according to expectations". 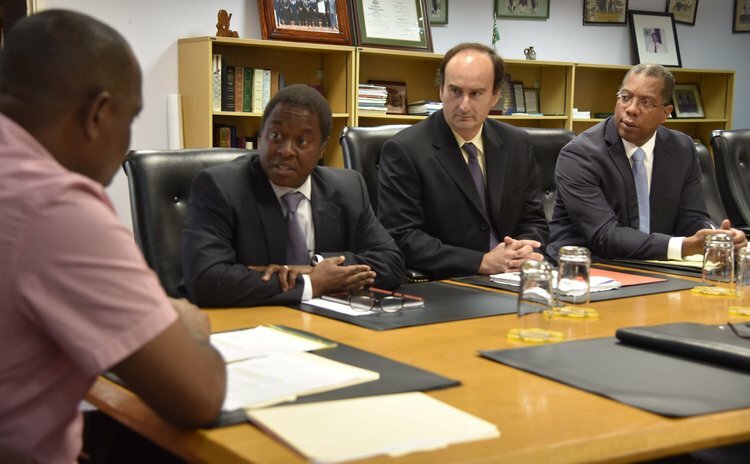 "An International Monetary Fund mission, led by Mr. Alejandro Guerson, visited Dominica during March 29-April 11 to conduct the 2016 Article IV consultation. Mr. Guerson issued the following statement at the mission's conclusion: "Tropical storm Erika hit the Dominican economy hard. Output is estimated to have declined by 3.9 percent in 2015 as a result of the storm. Tourism activities have largely normalized following the resumption of full operations at the main airport, and visitor arrivals showed some recovery. Other sectors will likely need more time to be fully restored. Agriculture output declined sharply as the storm affected crops and access to arable land, and significant areas are now in need of re-planting and soil treatment. Manufacturing has taken a significant toll as the storm prompted the closure of operations of the main industrial plant. In addition, the protracted decline of banks' credit to the private sector remains a drag on economic activity, underpinned by high non-performing loans. Inflation has remained subdued, within a slightly negative range on a year-on-year basis, mainly as a result of falling fuel prices. Notwithstanding weak exports of agriculture and tourism, the 2015 current account deficit remained contained at an estimate of 9.4 percent of GDP on the back of lower oil imports. "Output growth is expected to remain subdued in 2016 at 1.3 percent as the economy slowly recovers from the storm and investment in reconstruction picks up. This growth, however, is largely conditional on donor grants proceeding according to expectations. Afterwards, growth is projected to accelerate somewhat as the economy continues to recover towards potential, and to stabilize at 1.7 percent per year over the medium-term. The current account is projected to deteriorate on the back of the increase in reconstruction investment, and then to gradually improve as exports of agriculture, tourism and manufacturing activities recover. The imbalances are expected to be financed primarily with external capital grants and official concessional loans. "The fiscal outturn for FY 2015/16 is strong, estimated at a surplus of 0.8 percent of GDP. It is benefitting from the increase of excise taxes and user fees, and the reinstatement of specific import duties. However, the underlying fiscal performance is somewhat weaker than the outturn suggests, as it was underpinned by the collection of tax arrears (in part transitory), higher ECP revenues (subject to uncertainty), and low capital expenditure. Going forward, fiscal policy should be calibrated to allow space for reconstruction expenditure within fiscally sustainable bounds, consistent with the regional debt target commitment. "The government should continue with its plan to adopt the reforms needed to support the recovery process and to ensure fiscal sustainability. The measures already identified are appropriate and consistent with the commitments in the RCF. These include further re-prioritization of public investment; wage restraint; a gradual unwinding of storm-related social assistance; and an update of off-shore bank licenses. The government should also start the specification of the second-generation fiscal measures, which require more time to develop, in amounts consistent with achieving the debt target. Measures under consideration include the rationalization of tax expenditures, a property tax reform, introduction of cost-recovery charges in the provision of health services, and measures to increase the efficiency of public education services. Moreover, complementing these with structural fiscal reforms is important to make fiscal consolidation gains durable. Such measures should focus on strengthening and supporting the budget process and its execution, including systems to improve public financial management, and improving the transparency of the ECP. Also, given the recurrence of natural disasters, the authorities should expedite their plans to build in sufficient fiscal space to be able to respond in case of such future events, and consider the creation of a saving fund, using some of the ECP revenues. "With regard to financial activities, the government has made substantial progress to revamp regulations, but significant risks continue to affect the sector. The recent passing of the new Banking Act and Eastern Caribbean Asset Management Company Act are important steps to mitigate these. Credit unions are in the process of consolidation, in agreement with the adoption of the regional initiatives to strengthen the regulatory and supervisory framework. Moreover, there has been significant progress in the AML/CFT legislation. However, the high level of non-performing loans and low capitalization across the financial industry pose risk to financial stability. Also, there is risk of losing correspondent banking relations, as is currently occurring in other countries in the region. This risk requires decisive action, aimed at improving the information position of financial institutions, monitoring for possible termination or increase in cost of correspondent banking relations, continuing to strengthen AML/CFT legislation, and exploring merger possibilities. A review of the lending policies of the National Bank of Dominica and the AID Bank aimed at facilitating more targeted programs would minimize distortions in the allocation of credit and better support developmental needs. "Improving growth prospects will depend on structural reforms to facilitate the contribution of the private sector. The government's Growth and Social Protection Strategy identifies key areas to increase growth, and reaffirms the role of the private sector as the main driver. The key areas of focus include the diversification of agriculture; investment in public infrastructure; increase of labor productivity; and the reduction in electricity tariffs. To further support private sector investment, the government should adopt measures to enhance the business climate; devise a strategy for diversification into a broader set of areas in addition to agriculture; remove impediments to backward linkages in agriculture and manufacturing; improve access to finance; increase the resilience of public infrastructure to natural disasters; improve and enforce construction and zoning codes; explore alternative sources to reduce the cost of electricity, including through developing the geothermal potential; and seek advice to improve education achievement and modernize labor regulations. "The IMF will continue to have a close dialogue with the authorities as they address these challenges. The mission would like to express its gratitude to the authorities for the close and constructive dialogue."